As the name implies, does offer Jumbo Satay specificity in terms of size of the satay. This culinary distinctiveness more special when it hit Jumbo Satay on the tongue. Satay Jumbo proved that not only special in size, but also has a distinct flavor that will not be felt from other satay. Owner and manager of Jumbo satay, Biesan presented with the special offer, be ready to succeed Jumbo Satay Visit Batam 2010 which relied on Batam City Government. Satay Jumbo will make visitors or domestic tourists and foreign tourists have visited do not regret this beloved city of Batam. Jumbo Satay can rely on to pull in tourists visiting Batam, because the sate is international cuisine that in fact has been recognized by the world community. Jumbo Sate will provide sensation and special memento after the tourists coming to Batam "Sate may also known as the steak abroad. Satay Jumbo is from Batam and only available in Batam. We expect her typical can-Jumbo Satay can lure tourists come to Batam again. "Said Biesan, the creator of a brilliant idea this Jumbo Satay. Jumbo Satay Biesan want to cirikhas Batam, therefore, as a manager, Satay Jumbo will not be opened outside the city of Batam. Whether it's own management or francise. In the future, Jumbo Satay will open strategic places in Batam. 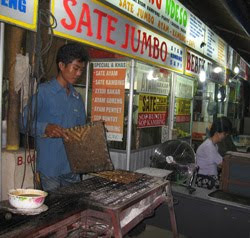 In order to reach more customers and Jumbo Satay characterized as typical culinary Batam.